1Other languages, such as Hungarian, German, Romani, Ukrainian and Serbian, are used at various local levels. Romania ( Romanian: România /ro.mɨˈni.a/) is a country in Southeastern Europe. Romania borders Hungary and Serbia to the west, Ukraine and Moldova to the northeast, and Bulgaria to the south. Romania has a stretch of sea coast along the Black Sea, and the eastern and southern Carpathian mountains run through its centre. 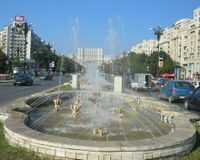 Historic Bucharest ( Romanian: Bucureşti /bu.kuˈreʃtʲ/ ) is the country's capital and largest city. Romania has been an active member of NATO since 2004, and is also an acceding country to the European Union. The EU Accession Treaty was signed in early 2005, and Romania is due to join the European Union on January 1, 2007. 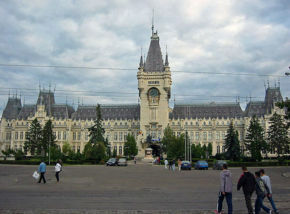 Starting on January 1, 2007, Romania will have the seventh largest population and the ninth largest territory in the EU. The name of Romania (România) comes from Român ("Romanian"), which is a derivative of the word Romanus ("Roman") from Latin. The fact that Romanians refer to themselves using a derivative of Romanus (Romanian: Român/Rumân) is mentioned in scholarly works as early as the 16th century by many authors, among them Italian humanists travelling in Transylvania, Moldavia and Wallachia. The oldest surviving document written in the Romanian language is a 1521 letter (known as " Neacşu's Letter from Câmpulung") which notifies the mayor of Braşov about the imminent attack of the Ottoman Turks. This document is also notable for having the first occurrence of "Rumanian" in a Romanian written text, Wallachia being here named "the Rumanian land" - Ţeara Rumânească (modern Romanian Ţara < 1521 Romanian Ţeara < Latin Terra = "land"). The teritory of Romania has been inhabited by different groups of people since prehistory. One of the fossils found - a male, adult jawbone - has been dated to be between 34,000 and 36,000 years old which would make it the oldest fossil found to date of modern humans in Europe. In 513 BC, south of the Danube, the tribal confederation of the Getae were defeated by the Persian emperor Darius the Great during his campaign against the Scythians (Herodotus IV.93). Over half a millennium later, the Getae (also named Daci by Romans) were defeated by the Roman Empire under Emperor Trajan in two campaigns stretching from 101 to 106, and the core of their kingdom was turned into the Roman province of Dacia. The Gothic and Carpic campaigns in the Balkans during 238–269 (from the beginning of the period of military anarchy to the battle of Naissus) forced the Roman Empire to reorganize a new Roman province of Dacia south of the Danube, inside former Moesia Superior. In 271 or 275 the Roman army and administration left Dacia, which was invaded by the Goths. The Goths lived with the local people until the 4th century, when another nomadic people, the Huns, arrived. 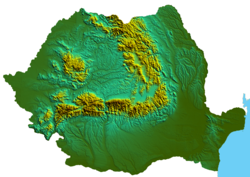 The Gepids and the Avars ruled Transylvania until the 8th century, after which the Bulgarians included the territory of modern Romania in their Empire until 1018. 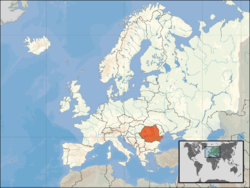 Transylvania was part of the Kingdom of Hungary from the 10-11th century until the 16th century, when the independent Principality of Transylvania was formed. The Pechenegs, the Cumans and Uzes were also mentioned by historic chronicles on the territory of Romania, until the founding of the Romanian principalities of Wallachia by Basarab I, and Moldavia by Dragoş during the 13th and 14th centuries respectively. In the Middle Ages, Romanians lived in two distinct independent Romanian principalities: Wallachia ( Romanian: Ţara Românească - "Romanian Land"), Moldavia ( Romanian: Moldova) as well as in the Hungarian-ruled principality of Transylvania. In 1475, Stephen the Great of Moldavia scored a decisive victory over the Ottoman Empire at the Battle of Vaslui. Wallachia and Moldavia would later come gradually under the suzerainty of the Ottoman Empire during the 15th and 16th centuries (1476 for Wallachia, 1514 for Moldavia) as vassal tributary states with complete internal autonomy and an external independence which was finally lost in the 18th century. One of the greatest Hungarian kings, Matthias Corvinus (known in Romanian as Matei Corvin), who reigned from 1458-1490, was born in Transylvania. He is claimed by the Romanians because of his Romanian father, Iancu de Hunedoara (Hunyadi János in Hungarian), and by the Hungarians because of his Hungarian mother. Later, in 1541, Transylvania became a multi-ethnic principality under the suzerainty of the Ottoman Empire following the Battle of Mohács. Michael the Brave (Romanian: Mihai Viteazul) (1558-9 August 1601) was the Prince of Wallachia (1593-1601), of Transylvania (1599-1600), and of Moldavia (1600). During his reign the three principalities largely inhabited by Romanians were for the first time united under a single rule. In 1775 the Habsburg Monarchy annexed the northern part of Moldova, Bukovina, and the Ottoman Empire its south-eastern part, Budjak. In 1812 the Russian Empire annexed its eastern half, Bessarabia, which was partially returned by the 1856 Treaty of Paris after the Crimean War. At the end of the 18th century, the Habsburg Monarchy incorporated Transylvania into what later became the Austrian Empire. During the period of the dual monarchy of Austria-Hungary (1867-1918), Romanians in Transylvania experienced a period of severe oppression under the Magyarization policies of the Hungarian government. The modern state of Romania was formed by the merging of the principalities of Moldavia and Wallachia in 1859 under the Moldavian domnitor Alexandru Ioan Cuza. He was replaced by Prince Karl of Hohenzollern-Sigmaringen in 1866, who became known as Prince Carol of Romania. 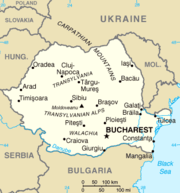 During the Russo-Turkish War, Romania fought on the Russian side; in the 1878 Treaty of Berlin, Romania was recognized as an independent state by the Great Powers. In return for ceding to Russia the three southern districts of Bessarabia that had been regained by Moldavia after the Crimean War in 1852, the Kingdom of Romania acquired Dobruja. In 1881, the principality was raised to a kingdom and Prince Carol became King Carol I.
Romania entered World War I on the side of the Triple Entente. The Romanian military campaign ended in disaster for Romania as the Central Powers conquered most of the country and captured or killed the majority of its army within four months. By war's end Austria-Hungary and the Russian Empire had collapsed, allowing Bessarabia, Bukovina and Transylvania to unite with the Kingdom of Romania in 1918. By the 1920 Treaty of Trianon, the restored Hungary renounced in favour of Romania all of claims of the Austro-Hungarian Monarchy over rights and titles in this new Romanian territory. During World War II, in 1940, the Soviet Union occupied Northern Bukovina and Bessarabia, Hungary occupied Northern Transylvania, and Bulgaria occupied southern Dobruja. The authoritarian King Carol II abdicated in 1940, succeeded by the National Legionary State, in which power was shared by Ion Antonescu and the Iron Guard. Within months, Antonescu had crushed the Guard, and the subsequent year Romania entered the war on the side of the Axis powers. 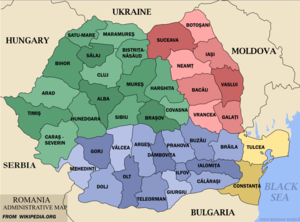 By means of the Axis invasion of the Soviet Union, Romania recovered Bessarabia and northern Bukovina from the Soviet Russia, under the leadership of general Ion Antonescu. Germany awarded the territory Transnistria to Romania. The Antonescu regime played a role in the Holocaust, following the Nazi policy of oppression and massacre of the Jews, and, to a lesser extent, Romas. According to a report released in 2004 by a commission appointed by former Romanian president Ion Iliescu and chaired by Nobel Laureate Elie Wiesel, the Romanian authorities were the main perpetrators in the planning and implementation of the killing of between 280,000 to 380,000 Jews , primarily in the Eastern territories Romania recovered or occupied from the Soviet Union and in Moldavia, though some estimates are even higher. In August 1944, Antonescu was toppled. Romania changed sides and joined the Allies, but its role in the defeat of Nazi Germany was not recognized by the Paris Peace Conference of 1947. With the Red Army forces still stationed in the country and exerting de facto control, communists and their allied parties claimed 80% of the vote in the 1946 Romanian elections, through a combination of vote manipulation, elimination and forced mergers of competing parties, establishing themselves as the dominant force. In 1947, King Michael I was forced by the communists to abdicate and leave the country. Romania was proclaimed a republic, and remained under direct military and economic control of the USSR until the late 1950s. During this period, Romania's resources were drained by the " SovRom" agreements: mixed Soviet-Romanian companies established to mask the looting of Romania by the Soviet Union, in addition to excessive war reparations paid to the USSR. A large number of people were arbitrarily imprisoned for political, economic or unknown reasons: detainees in prisons or camps, deported, persons under house arrest, and administrative detainees. Political prisoners were also detained as psychiatric patients. Estimations vary, from 60,000, 80,000, up to two million. There were hundreds of thousands of abuses, deaths and incidents of torture against a large range of people, from political opponents to ordinary citizens. Most political prisoners were freed in a series of amnesties between 1962 and 1964. One positive achievement during the period of Soviet control was the spread of near-universal literacy. However, this educational transformation was not coupled with commensurate industrial development and urbanization policies, so that almost half of Romania's population is still rural (47.3%; see Demography of Romania). After the negotiated retreat of Soviet troops, in 1958, Romania started to pursue independent policies, including the condemnation of the Soviet-led 1968 invasion of Czechoslovakia (Romania was the only Warsaw Pact country not to take part in the invasion), the continuation of diplomatic relations with Israel after the Six-Day War of 1967 (again, the only Warsaw Pact country to do so), the establishment of economic (1963) and diplomatic (1967) relations with the Federal Republic of Germany, and so forth. Also, close ties with the Arab countries (and the PLO) allowed Romania to play a role in the Israel-Egypt and Israel-PLO peace processes. A short-lived period of relative economic well-being and openness followed in the late 1960s and the beginning of the 1970s. As Romania's foreign debt sharply increased between 1977 and 1981 (from 3 to 10 billion US dollars), the influence of international financial organisms such as the IMF or the World Bank grew, conflicting with Nicolae Ceauşescu's autarchic policies. Ceauşescu eventually initiated a project of total reimbursement of the foreign debt (completed in 1989, shortly before his overthrow). To achieve this goal, he imposed policies that impoverished Romanians and exhausted the Romanian economy. He profoundly deepened Romania's police state and imposed a cult of personality which led to his overthrow and death in the Romanian Revolution of 1989. After the fall of Ceauşescu, the National Salvation Front (FSN), led by Ion Iliescu and lacking a clear political platform, restored civil order and took partial democratic measures. Several major political parties of the pre-war era, such as the National Christian Democrat Peasant's Party (PNTCD), the National Liberal Party (PNL) and the Romanian Social Democrat Party (PSDR) were resurrected. In April 1990, a sit-in protest contesting the results of the recently held parliamentary elections began in the University Square, Bucharest. The protesters accused the FSN of being made up of former Communists and members of the Securitate. The protesters did not recognize the results of the election, which they deemed undemocratic, and were asking for the exclusion from the political life of the former high-ranking Communist Party members. The protest rapidly grew to become an ongoing mass demonstration (known as the Golaniad). The peaceful demonstrations degenerated into violence. After the police failed to bring the demonstrators to order, Ion Iliescu called on the "men of good will" to come and defend the Bucharest and State institutions. Coal miners of the Jiu Valley answered the call and arrived in Bucharest on June 14. Their violent intervention is remembered as the June 1990 Mineriad. The subsequent disintegration of the FSN produced several political parties including the Democratic Party (PD), the Romanian Democrat Social Party (PDSR, later Social Democratic Party, PSD), and the APR (Alliance for Romania). The Socialist parties that emerged from the FSN governed Romania from 1990 until 1996 through several coalitions and governments with Ion Iliescu as head of state. 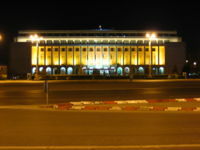 Since then there have been three democratic changes of government: in 1996, the democratic-liberal opposition and its leader Emil Constantinescu acceeded to power; in 2000 the Social Democrats returned to power, with Iliescu once again president; and in 2004 Traian Băsescu was elected president, with an electoral coalition called Justice and Truth Alliance (DA). The government was formed by a larger coalition which also includes the Conservative Party and the ethnic Hungarian party. Post-Cold War Romania developed closer ties with Western Europe, eventually joining NATO in 2004. The country applied in June 1993 for membership in the European Union (EU). It became an Associated State of the EU in 1995, an Acceding Country in 2004, and is currently expected to join as a member on January 1, 2007. The Treaty of Accession of Romania was signed by EU member states' representatives in Luxembourg, Abbaye de Neumünster, on April 25, 2005. Ratification of the Romanian and Bulgarian Accession Treaty is ongoing in the parliaments of all member states. 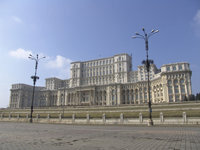 Victoria Palace, the headquarters of the Romanian Government. Romania is a semi-presidential democratic republic where executive functions are shared between the president and the prime minister. The president is elected by popular vote, and resides at Cotroceni Palace. Since the constitutional amendment of 2003, the president's term is five years (previously it was four). The Romanian Government, which is based at Victoria Palace, is headed by a prime minister, who appoints the other members of his or her cabinet and who is nearly always the head of the party or coalition that holds a majority in the parliament. If, however, none of the parties hold 50% + 1 of the total seats in parliament, the president will appoint the prime minister. Before beginning its term, the government is subject to a parliamentary vote of approval. The legislative branch of the government, collectively known as the Parliament (Parlamentul României), consists of two chambers – the Senate (Senat), which has 137 members, and the Chamber of Deputies (Camera Deputaţilor), which has 332 members. The members of both chambers are elected every four years under a system of party-list proportional representation. The justice system is independent of the other branches of government, and is made up of a hierarchical system of courts culminating in the High Court of Cassation and Justice, which is the supreme court of Romania. There are also courts of appeal, county courts and local courts. The Romanian judicial system is strongly influenced by the French model, considering that it is based on civil law and is inquisitorial in nature. The Constitutional Court (Curtea Constituţională) is responsible for judging the compliance of laws and other state regulations to the Romanian Constitution, which is the fundamental law of the country. The constitution, which was introduced in 1991, can only be amended by a public referendum; the last amendment was in 2003. The Romanian Constitutional Court structure is based on the Constitutional Council of France, being made up of nine judges who serve nine-year, non-renewable terms. Following the 2003 constitutional amendment, the court's decisions cannot be overruled by any majority of the parliament. Romania has good relations with Republic of Moldova being considered as an active brother country. Romania's relations with neighbour Moldova have been strained since 1994. Moldova was part of Romania during the interwar period and linguists agree that the Moldovan language is identical to Romanian. However, the Moldovans have been ambivalent about whether they consider themselves Romanians or Moldovans. Early signs that Romania and Moldova might unite after both countries achieved emancipation from communist rule quickly faded. Romania remains interested in Moldovan affairs, especially that country's civil conflict with the breakaway region of Transnistria. However, the two countries have been unable even to reach agreement on a basic bilateral treaty; Romania is insistant (against determined Moldovan resistance) that such a treaty would have to refer to Romania and Moldova's 'special relationship'. Administrative map of Romania outlining the forty-one counties. The map also shows the historical region of Transylvania in green, Wallachia in blue, Moldavia in red, and Dobrogea in yellow. Alongside the county structure, Romania is also divided into eight development regions, which correspond to NUTS-II divisions in the European Union, but which have no administrative capacity and are instead used for co-ordinating regional development projects and statistical purposes. Physical map of Romania showing the Carpathian Mountains. With a surface area of 238,391 km², Romania is the largest country in southeastern Europe and the twelfth-largest in Europe. A large part of Romania's border with Serbia and Bulgaria is formed by the Danube. The Danube is joined by the Prut River, which forms the border with the Republic of Moldova. The Danube flows into the Black Sea on Romanian territory, forming the Danube Delta, the largest delta in Europe, which is currently a biosphere reserve and World Heritage-listed site due to its biodiversity. The country's most significant rivers are the Danube, which marks part of the border between Romania and Bulgaria, the Siret, running vertically through Moldavia, the Olt, running from the oriental Carpathian Mountains to Oltenia, the Tisa, marking a part of the border between Romania and Hungary, the Mureş, running through Transylvania from East to West, and the Someş. There is a certain symmetry in the physical structure of Romania. The country forms a complex geographic unit centred on the Transylvanian Basin, around which the peaks of the Carpathian Mountains and their associated subranges and structural platforms form a series of crescents. Beyond this zone, the extensive plains of the south and east of the country, their potential increased by the Danube and its tributaries, form a fertile outer crescent extending to the frontiers. There is great diversity in the topography, geology, climate, hydrology, flora, and fauna, and for millennia this natural environment has borne the imprint of a human population. The Romanian people derive much of their ethnic and cultural character from Roman influence, but this ancient identity has been reshaped continuously by Romania's position astride major continental migration routes. Since the late 19th century, in particular, Romania has undergone an economic and social transformation from an agricultural society to an urbanized, industrial society. The World Trade Centre in Bucharest, the capital and economic centre of Romania. 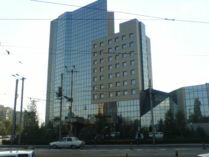 World Trade Centre in Iaşi. With a GDP per capita ( PPP) of $14,800 in 2007 Romania is an high developed economy and will become part of the European Union in 2007. After the Communist regime was overthrown in late 1989, the country experienced a decade of economic instability and decline, led in part by an obsolete industrial base and a lack of structural reform. From 2000 onwards, however, the Romanian economy was transformed into one of relative macroeconomic stability, characterised by high growth and low unemployment. In 2004, GDP growth was 8.4%, one of the highest in Europe, even though this rate was halved in 2005, to 7.1%, mainly due to floods in significant agricultural areas. In 2006, growth is expected to exceed 7%. Unemployment in Romania was at 5.0% in September 2006 which is very low compared to other middle-sized or large European countries such as Poland, France, Germany and Spain. Foreign debt is also comparatively low, at 20.3% of GDP. Exports have increased substantially in the past few years, with a 24.8% year-on-year rise in exports in the first quarter of 2006. Romania's main exports are clothing and textiles, industrial machinery, electrical and electronic equipment, metallurgic products, raw materials, cars, military equipment, software, pharmaceuticals, fine chemicals, and agricultural products (fruits, vegetables, and flowers). Trade is mostly centred on the member states of the European Union, with Germany and Italy being the country's single largest trading partners. After a series of privatisations and reforms in the late 1990s and early 2000s, government intervention in the Romanian economy is somewhat lower than in other European economies. 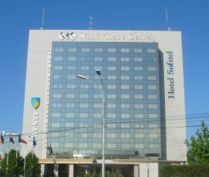 In 2005, the liberal- democrat Tăriceanu government replaced Romania's progressive tax system with a flat tax of 16% for both personal income and corporate profit, resulting in the country having one of the lowest fiscal burdens in Europe, a factor which has contributed to the growth of the private sector. The economy is predominantly based on services, which account for 54.9% of GDP, even though industry and agriculture also have significant contributions, making up 35.0% and 10.1% of GDP, respectively. Additionally, 31.6% of the Romanian population is employed in agriculture and primary production, one of the highest rates in Europe. Since 2000, Romania has attracted increasing amounts of foreign investment, becoming the single largest investment destination in Southeastern and Central Europe. Foreign direct investment was valued at €5.2 billion in 2005, an increase of 26.8% over 2004. According to a 2006 World Bank report, Romania is currently ranked 49th out of 175 economies in the ease of doing business, scoring higher than other countries in the region such as Hungary, Poland and the Czech Republic. Additionally, the same study judged it to be the world's second-fastest economic reformer in 2006. The average gross wage per month in Romania is 1280 lei as of November 2006, equating to €353.96 (US$468.11) based on international exchange rates and $810.45 based on purchasing power parity. According to the 2002 census, Romania has a population of 21,680,974 and, similarly to other countries in the region, is expected to gently decline in the coming years as a result of sub-replacement fertility rates. Romanians make up 89.5% of the population. The largest ethnic minorities are Hungarians, who make up 6.6% of the population and Roma, who make up 2.5% of the population. Hungarians, who are a sizeable minority in Transylvania, constitute a majority in the counties of Harghita and Covasna. Ukrainians, Germans, Russians, Bulgarians, Turks, Tatars, Serbs, Slovaks and Poles, as well as other ethnic groups, account for the remaning 1.4% of the population. It is expected that by year 2060 Romania will have 50 millions inhabitants. The population density of the country as a whole has doubled since 1900 although, in contrast to other central European states, there is still considerable room for further growth. The overall density figures, however, conceal considerable regional variation. Population densities are naturally highest in the towns, with the plains (up to altitudes of some 700 feet) having the next highest density, especially in areas with intensive agriculture or a traditionally high birth rate (e.g., northern Moldavia and the “contact” zone with the Subcarpathians); areas at altitudes of 700 to 2,000 feet, rich in mineral resources, orchards, vineyards, and pastures, support the lowest densities. The official language of Romania is Romanian, an Eastern Romance language related to French, Spanish, Italian and Portuguese. Romanian is spoken as a first language by 91% of the population, with Hungarian and Romani being the most important minority languages, spoken by 6.7% and 1.1% of the population, respectively. Until the 1990s, there was also a substantial number of German-speaking Transylvanian Saxons, even though many have since emigrated to Germany, leaving only 45,000 native German speakers in Romania. In localities where a given ethnic minority makes up more than 20% of the population, that minority's language can be used in the public administration and justice system, while native-language education and signage is also provided. 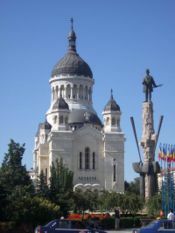 Romanian Orthodox cathedral in Cluj-Napoca. The Romanian education system places a strong emphasis on foreign language, with French and English being the most spoken languages. English is spoken by 5 million Romanians, French is spoken by 4-5 million, and German, Italian and Spanish are each spoken by 1-2 million people. Historically, French was the predominant foreign language spoken in Romania, even though English has since superseded it. Consequently, Romanian English-speakers tend to be younger than Romanian French-speakers. Romania is, however, a full member of La Francophonie, and hosted the Francophonie Summit in 2006. Romania is a secular state, thus having no national religion. The dominant religious body is the Romanian Orthodox Church, its members making up 86.7% of the population according to the 2002 census. Other important religions include Roman Catholicism (4.7%), Protestantism (3.7%), Pentecostal denominations (1.5%) and the Romanian Greek-Catholic Uniate Church (0.9%). Romania also has a small but historically significant Muslim minority, concentrated in Dobrogea, who are mostly of Turkish ethnicity and number 67,500 people. Based on the 2002 census data, there are also approximately 6,000 Jews and 2,300 people who are of no religion and/or atheist. The Christian holidays of Christmas and (Orthodox) Easter are celebrated (they are official, non-working, holidays). Unlike some other Eastern Orthodox Churches, the Romanian Orthodox Church celebrates Christmas on 25 December; however, they follow the usual Eastern Orthodox practice for the date of Easter. Other official holidays (non-working) are New Year's Day ( January 1), Labour Day ( May 1), and the National Day of Romania ( December 1, the Union Day). For Christmas and for Labour Day, it is common for businesses to shut down more than a single day. Minor, but widely observed, holidays include Mărţişor ( March 1), marking the start of spring, and International Women's Day ( March 8). Many businesses give women employees the day off for International Women's Day. Some holidays celebrated in the United States or in other parts of Europe have recently been gaining some currency in Romania, for example Valentine's Day ( February 14). The culture of Romania is rich and varied. Like Romanians themselves, it is fundamentally defined as the meeting point of three regions: Central Europe, Eastern Europe and the Balkans, but cannot be fully included in any of them. The older classics of Romanian literature remained very known outside Romania. Traditionally Romanians appreciate poetry more than Romanian prose. Mihai Eminescu, a famous 19th century Romanian poet is still very much loved in Romania (especially his collection of Poems), among several other "true classics" like George Coşbuc. The revolutionary year 1848 had its echoes in the Romanian principalities and in Transylvania, and a new elite from the middle of the 19th century emerged from the revolutions: Mihail Kogălniceanu (writer, politician and the first prime minister of Romania), Vasile Alecsandri (politician, playwright and poet), Andrei Mureşanu (publicist and the writer of the current Romanian National Anthem) and Nicolae Bălcescu (historian, writer and revolutionary). The works of George Enescu are well-known to Romanians, many of whom consider him their national musician. The symphony orchestra of Bucharest is named in Enescu's honour. Romanian literature has recently gained some renown outside the borders of Romania (mostly through translations into German, French and English). Some modern Romanian authors became increasingly popular in Germany, France and Italy especially Eugen Ionescu, Mircea Eliade and Mircea Cărtărescu. Romanian tourism focuses on the country's natural landscapes from the heights of the Carpathian Mountains to the Danube Delta and the hot Black Sea shores. On the UNESCO List of World Heritage Sites there are some of Romania's most unique places shuch as the Saxon villages with fortified churches in Transylvania, the Painted churches of northern Moldavia with their fine exterior and interior frescoes, the Wooden Churches of Maramures unique examples that combine Gothic style with traditional timber construction, the citadel of Sighişoara and the Dacian Fortresses of the Orăştie Mountains. Also, in 2007, the city of Sibiu will be the European Capital of Culture alongside the city of Luxembourg. The gymnast Nadia Comaneci was the first gymnast to score a perfect "ten" in the 1976 Summer Olympics. She also won three gold medals, one silver and one bronze, all at the age of fifteen. Her success continued in the 1980 Summer Olympics, where she was awarded two gold medals and two silver medals. Ilie Năstase, the tennis player, is another internationally known Romanian sports star. He won several Grand Slam titles and dozens of other tournaments; he also was a successful doubles player. Romania has also reached the Davis Cup finals three times. Football is popular in Romania, the most internationally known player being Gheorghe Hagi who played for Steaua Bucureşti (Romania), Real Madrid, FC Barcelona (Spain) and Galatasaray (Turkey) among others. The Romanian soccer club Steaua Bucureşti was the first Eastern European club to ever win the prestigious European Champions Cup title (1986). Though maybe not the force they once were, the Romanian national rugby team has so far competed at every Rugby World Cup.